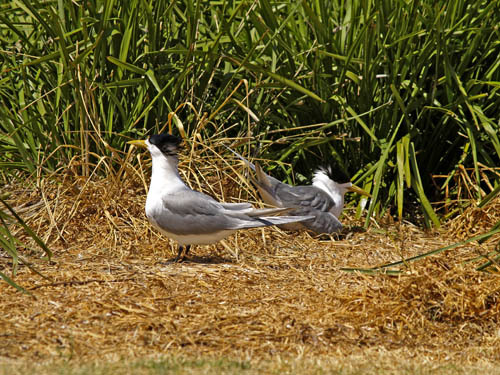 Crested terns looking after their nest. Montague Island, Australia. IPTC Keywords: Australia Montague Island Tours Montague Island Nature Reserve Narooma NSW New South Wales South Coast Eurobodalla little penguins fairy penguins shearwaters mutton birds silver gulls crested terns lighthouse Montague Island Lighthouse ecotourism Conservation Volunteers Australia Department of Environment and Conservation national park.